Discussion in 'Forest of FallenLight' started by Paintfury, Jul 4, 2018. I’ve been working on the Wiki recently and figured, perhaps, personal kitties could have their own separate links and such. That being said, if you’re interested just fill out the little form thing below! Hope all of that makes sense! Go wild with your forms and add anything else you want!! I'd love one for Sunny D!!! Trivia/Fun Facts: Sunstar's favorite color is red, and she has an affinity for blue eyes. She's also adopted. Appearance: A grey tabby tom with white specks, one white paw, and water blue eyes. He is missing an eye from when Grumpyface took it out. Personality: Ranitail is a generally optimistic cat. Nothing really bothers him that much. However, when it comes to a debate between right and wrong or loyalty he'll quickly pick sides. After his experience with Wolfstar in Meadowclan he isn't one to sit by and watch cats be mistreated. Backstory: Raintail was a loyal warrior to his former clan, Meadowclan. He never questioned any of his leader's actions and was at peace with the life he had. However, everything changed when Wolfstar took command. He had overheard a conversation between him and his former friend, Grumpyface. Wolfstar had asked the other cat to be second in command and fight alongside him against Sleetclan. Wolfstar tried to make an example of what he did to "traitors", ordering Grumpyface to remove Raintail's tail. Raintail pleaded his innocence but to no avail, being attacked by his former friend Grumpyface and losing an eye in the battle. Following the event, he led a group of Meadowclan cats to Driftclan, where he hoped that would have a better life and be treated fairly. Personality: Spirit, at a young age, was always very curious about the world, very perky, and confused by a lot of things. Though, when his parents died, he fell into a darker depression that took him awhile to get over. Now he is mostly back to his kit-ish self, having also developed a want to make everyone as cheerful as possible because he's tired of things being sad and a mother-like attitude towards anyone and everyone who he deems needs to be cared for. Backstory: Spiritkit was born to Dreamcatcher and Brittebranch alongside two sisters. Since he could walk, he had been stumbling around, looking for something interesting. His curiosity was what brought him to Bubbleshine and later got him to be her apprentice. Spiritpaw did his best as an apprentice, always making up weird ways to remember herbs (and avoiding cobwebs at all costs). Though, also in his apprenticeship, his parents both died from causes that might have been helped if Spirit had acted fast enough. Because of this, Spiritpaw blamed himself, falling into a sort of depression as Bubbleshine stepped down and Spirit was made medicine cat of MeadowClan. The one thing that eventually got him out of this very dark place was his acquaintance with Coriandersprig, the medicine cat of EclipseClan. They quickly formed a relationship, meeting at the border of the clans, Spirit usually on his way to collect comfrey or other herbs. Though, when Coriandersprig asked if they were mates, Spirit said that he'd rather not it be called that or be in that area until they weren't medicine cats anymore, trying to avoid breaking the rules as much as possible. Spiritsong later chose his apprentice, Goldenpaw, and trained her best he could, soon retiring from his job so she could take his place. Coriandersprig also retired and left his clan to join DriftClan, Spirit soon to follow. Though, before he left, Spirit's sister, Mudwing, gave birth. Because of a condition Mudwing had, one that meant her death before she could reach an old age and the thing Spirit had been foreboding for awhile because of his fear of losing another member of his shrinking family, Spiritsong's sister died during the birth of her four kits, only one of which lived and this being Bluekit. Right after such, Spiritsong placed the tom-kit in the Nursery and immediately left for DriftClan to join Coriandersprig, despairing at his sister's death. Sunstar excepted him into the clan and that is where he currently resides. Trivia/Fun Facts: Spiritsong had a speech impediment as a kit and used to call himself 'Swearitkwit' (and variations of such) because of it. Spirit also loves to give other cats nicknames, such as CilantroLove (Coriandersprig), milk-mom (Brittlebranch, his mother), and Miss Leader Ma'am (Sunstar). Appearance: Orange tabby with a slightly crooked tail. His ear tips are white and his tailtip is white, also. He has one green eye and one hazel eye. He has a white underbelly with orange spots. White stripes line his back and flanks. Personality: Blaze is outgoing and persistent, and usually doesn't take no for an answer. He also is very loving and sweet to those who love him, and does whatever he can to help them. He loves all of his kits, and is a great father to them all. Backstory: Blazingskies was an abandoned kit found at the edge of the border and was taken in and joined DC. He grew up without any family and developed slight trust issues, as the clan saw him as an outcast until he met his first lover, Willowheart. She accidentally got pregnant and he left her out of guilt and nervousness. He then took his first mate, Featherdust, and had kits with her. She died soon after, and he was mortified. A few moons later, he met Frostpool, and had kits with her, but she left him and ran away. Again, he became depressed and became friends with Honeystar. She soon chose him as her deputy and he later became Blazingstar. Mate/Crush: Former Mates: Willowheart, Featherdust, and Frostpool. Offspring: Sunstar (Female, Adopted), Deathberry (Male, Stepson), Rainbowstream (Female), Fogkit (Male), Lionkit (Male), Magnoliapaw (Female), Moonkit (Female), Skieskit (Female), Stonecrackle (Female), Streamsearch (Female). Lives lost and how: First: falling from a tree. Second: Sickness. Third: Sickness again rip. Fourth: Drowning. Fifth: Killed by a rogue. Sixth: Infection from a cut. Seventh: Unknown Eighth: Suffocating. Appearance: A small, white she-cat with an orange backside, tail, and ears. Her eyes are ice blue and she has an orange patch on her left eye. Her left hind leg is orange along with her right front paw. Underneath her right eye is an orange marking similar to a heart with surrounding freckles. She occasionally wears a flower crown with small blue and purple flowers. Personality: Gingerbranch is a generally nice cat, and tried her best to keep a positive attitude. She is calm and collected, although can get very frustrated at times. She will not hesitate to defend herself or her clan if she has to, and is always looking for something she can do to help. Backstory: Gingerkit never looked forward to becoming an apprentice, she always wanted to do something else. She never found interest in being a warrior from the very start. When her best friend Bugkit was killed in a tragic accident, her entire personality changed. She never wanted anything like that to ever happen again. Sunshower decided that she would best suit the role of a medicine cat, and declared her as the medicine cat apprentice. She needed to be mentored by Coriandersprig from Eclipseclan, because Driftclan had no medicine cat at the time. Appearance: Kiwimist is a pure black she cat with one hazel and one blue eye. Her muzzle is a dark mocha color, and she has brown spots all over her body. Personality: Kiwi is sweet and thoughtful, but can be feisty whenever somebody threatens or endangers her or her family. She also is very stubborn, and sticks to what she believes in. Quote: "You young cats are so focused on what's ahead of you, you never look down and see what's in front of you. Sometimes if what's in front of you is good enough, you'll forget about your future and focus on the present." -Kiwimist to Spottedpaw after she caught her meeting Thistlepaw at the border. 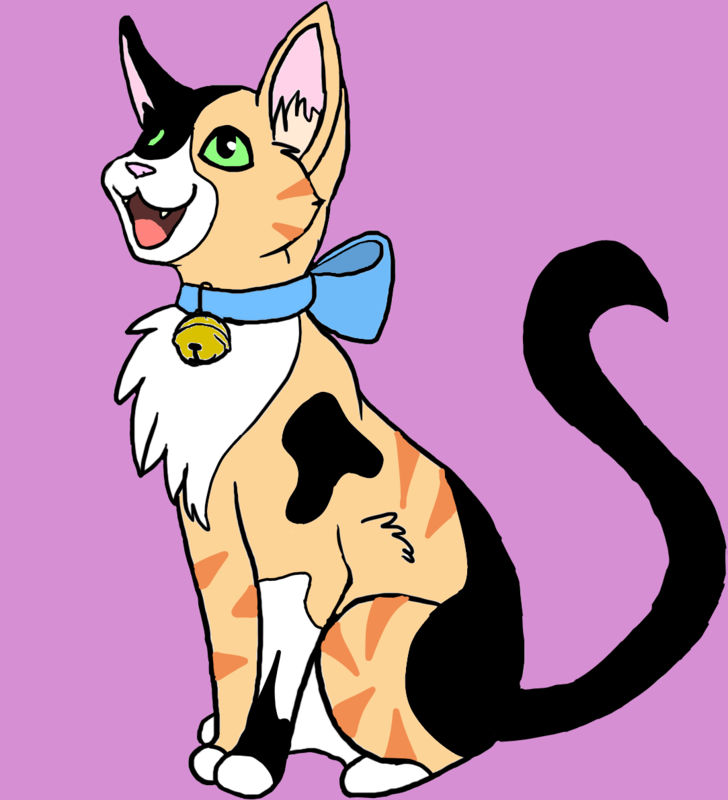 Backstory: Kiwimist was born and raised in Eclipseclan, and that's all she's ever known. When she met Stormstar, however, she became that cat she is today. She became kind and thoughtful, but her stubbornness and feistiness stayed. She learned how to be friends with people, and how to not snap at everything she sees. Appearance: Sandstream is a small, sandy-pelted tom with white belly. He has brown eyes with a long tail. Personality: Sandpaw is a cheerful cat. He can be shy around strangers, but is quite charismatic. He can be tough on himself, but he forgives easily, as long as he sees that people are regretful. Recently, he has found it hard to form bonds. He rarely gives up. Backstory: When he was 3 moons old, Sandstream's (then Sand) family was murdered by a rogue ex-clan cat. He was then found by Sunshower at the Driftclan border, where he became an apprentice 3 moons later. Near the end of his apprenticeship, his back was injured by a pigeon, postponing his apprenticeship and giving him his fear. He later recovered and became a warrior, and disappeared soon after to try and figure some things out in his past. While he was away, he found his old den-mate, Slate. They became mates, and had kits. However, they were killed by a rogue, (Unnamed). Sandstream tracked him down for a moon and killed him in revenge. He still hasn't forgiven himself. Trivia/Fun Facts: Sandstream used to be afraid of pigeons. Appearance: Lilly is a small calico she-cat with green eyes. She wears a blue ribbon with a bell around her neck. Personality: Lilly has a playful personality and likes to talk to passing loners. She is very curious about the world around her and wants to explore. If insulted, she will attack the cat, despite not knowing how to fight. Backstory: Lilly was only with her mother until she was able to be given away to another housefolk. She currently lives with an elderly woman. Trivia/Fun Facts: Lilly has her front two paws declawed.